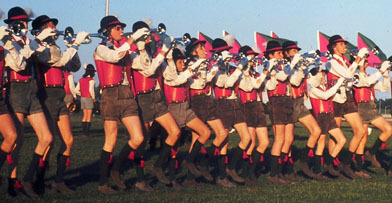 The corps traveled to Munich, Germany in the fall of 1974 for Oktoberfest and became the second North American corps to tour Europe (Alberta All Girls Drum Corps were the first in 1972). They played at the World Cup Soccer Championships in the Olympic Stadium. The Alberta All Girls also performed here at the 1974 Championships as well. As this happened some 32 years ago, I think any person who has had a similar experience can relate to our eight-day trip. This trip took place after the season was over in September of 1974. We landed in Munich, Germany, to perform for the mayor’s soccer match. Not much of a performance — just once around a track — no big deal. They told us we were going inside the Olympic Stadium. A lot of us didn’t think much about it until later. As I was one of the first and oldest corps members inside, I couldn’t believe my eyes. There were wall-to-wall people. The stadium holds 80,000 soccer fans. We started walking out to the field and you could feel everyone tense up. When you are used to performing in front of 2,000 people and then you have something like this thrown at you, your whole attitude changes. As we started our show, nothing really happened crowd-wise until we finished our first song. The audience went nuts and things just got better from there. After we were done with our show and were trooping the stands, 80,000 people rose and chanted “CA-NA-DA, CA-NA-DA.” Talk about feeling like William the Conqueror. That was an awesome feeling and one that we will never forget, ever! This trip was being planned for two years before we were told about it. It was planned through the German Department of Tourism and the corps. I think they saw us at Oktoberfest, and then asked our corps director if we would like to come over. It cost the corps a lot of money to pay for plane fares for every one, but it was well worth it. I’m not sure about this, but we might have been the first North American corps to go to Europe.